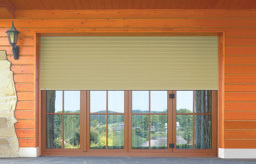 Exterior roller blinds protect privacy, reduce the excessive noise and negative atmospheric conditions. They improve the security level of each house. 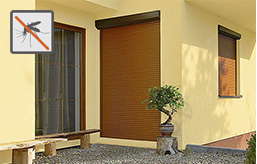 The basic elements of roller blind are the box and shutter which by means of rails is rolled to the box. When choosing one of four DK-PROF systems of roller blinds pay attention to following aspects: 1. 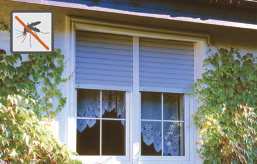 When is a roller blind installed: is it in the construction or during the renovation? 2. Where is the box situated:from side of elevation or inside the building? 3. Where the service cover for conservation is situated? Elevation roller blinds DK-RZS, DK-RZP, DK-RZO can be applied to newly-built and already existing objects. The installation is on the wall or window frame. There is a possibility to choose the shape of covering box. 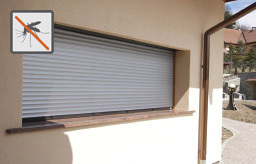 Incorporated roller blinds DK-RSP are applied to newly-built objects, during the building insulation.The roller blind box is covered with the elevation material. The visible service cover is placed in lower part of box. Top-mounted roller blinds DK-RNB, DK-RNC are installed in window bay in newly-built objects as well as during the windows exchange. The box can be partly or totally covered. Lintel roller blinds DK-RKS are designed for newly-built objects. The boxes of roller blinds are prepared building elements which are mounted during the wall increase.